Beware of certain Flea and Tick treatments! Spring is upon us… I think… Summer seemed to be here for a few days and then we were back to fall in an instant… Someone needs to write the weather a prescription for it’s bipolar mood swings lately… or maybe its “that time of the month” and it needs some midol… Annnnnyyywwwwayyyyyssss……..
Now that the weather is warming up, the ticks and bugs will be out in full force. Both my pups got their heartworm tests done and started their Heartworm meds today. I also gave them their first squirts of Frontline today. Which fueled my post today. I know Frontline tends to be pricier than all the other flea and tick treatments out there, but there is a reason. Frontline has been around, been tested, and is safe for dogs. Maybe I’ve confused you, and you’re thinking why would Petsmart or any other store sell a product that isn’t safe? I wonder that too. And Petsmart didn’t seem to care when opinions were expressed about them discontinuing the sale of a particular product, not only by myself but hoards of other users. Flashback time (cue wavy watery screen transition to 2 years ago). Back when Bacio was about a year old and Yuki was 3, it was summer time and time for the preventive maintenance on the dogs. Bacio was finally old enough to get a flea and tick treatment, while he was a pup we just used a flea collar. When you have two large dogs, it gets kinda pricey to buy all the top of the line stuff for both of them. I keep them on a pretty high quality dog food, and give them high quality ingredient treats. As I looked at the flea and tick treatments, Frontline was quite a bit more than the other products on the shelf. Bacio and Yuki are city dogs, so I didn’t really think flea and tick meds were all that important since they aren’t wandering in the woods and outside. I grabbed one of the inferior products. Sentry Pro XFC. Do Not ever, EVER, buy this evil product. I read the directions and squeezed the chemicals on both of the dogs. That same day we had a vet visit to get the dogs up to date on their shots. Bacio was a bit annoyed with the flea and tick meds, but we chalked it up to the first time he had one of the treatments. The day went on, and Bacio kept trying to lick his back and he was biting his fur, going kind of nutso. I put a t-shirt on him to keep him from licking and hoped the stuff would dry so he’d calm down. Half a day after the treatment was put on, it was nearing the evening and getting to be time to start relaxing and winding down. Bacio was still uncomfortable, but I had no idea the extent of his discomfort. As I was sitting around, Bacio gets up, tries to walk away from his bed, and just projectile vomits everywhere. Seriously… dogs projectile vomiting is one of the scariest sights I’ve seen… it was like the exorcist type of thing. He vomited 3 times, and I was on the phone with Dr. Andy. He told us to bring him in ASAP, maybe it was a reaction to the shots or something he had earlier in the day. We got to the vet, I brought the flea and tick meds with me. He looked up the meds and found thousands of complaints and records on vet forums about this crap. Bacio needed steroid shots to help his body fight this toxin and he was put on anti histamines. We had to go home and wash both him and Yuki immediately. 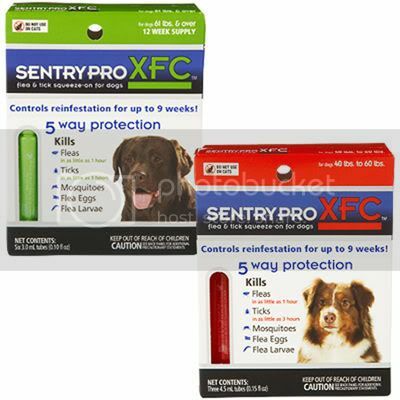 Sentry Pro XFC has a history of burning, blistering, and eating away at a dog’s skin. It is pretty much putting a pesticide directly on your pup. We got lucky that Bacio reacted in the way he did and washed the poison off of him in time. His skin was very raw, and only had minimal blisters. He was very itchy for a while after that. Even now, you can see his fur grew back a bit discolored, almost orangish where the Sentry Pro was put on him. I felt like such a terrible person after the incident. I went online to research the product and the first thing that came up was a blog entry that had over 800 comments about similar experiences. Some people even had pets die from this stuff. Petsmart and Petco have been contacted but haven’t removed it from their shelves, I think that is ridiculous. So I’ve been doing my best to tell other dog owners to NEVER use Sentry products. Spend the extra cash and use Frontline, or else you’ll be in an emergency vet spending wayyyyy more than the cost of Frontline to get your dog’s skin to heal. Please Please, learn from my mistake and spread the word so other pups don’t go through what Bacio did. That’s all for today.